Thomas Cook Airlines launched a new route from Manchester to Tobago as part of a strategic expansion of winter destinations the carrier can fly to and wanted to encourage audiences to feel excited that they can now reach new places, in style and at a great price. 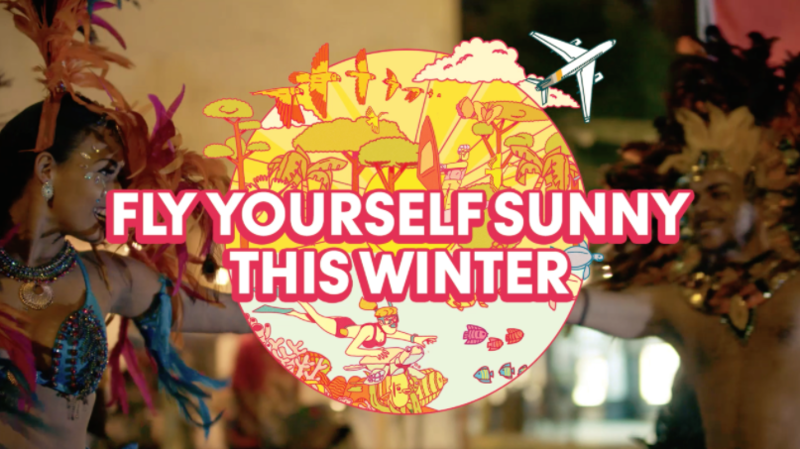 Working with Thomas Cook Airlines, we decided to build on the national OOH and advertising campaign with a more specific and targeted focus tapping into the peak booking period for winter holidays in the sun. To engage with a specific demographic inside the catchment area for Manchester Airport, we took advantage of the high footfall in the city centre with an experiential event, supported by social media which would allow Catch to deliver a measurable impact on flight bookings. 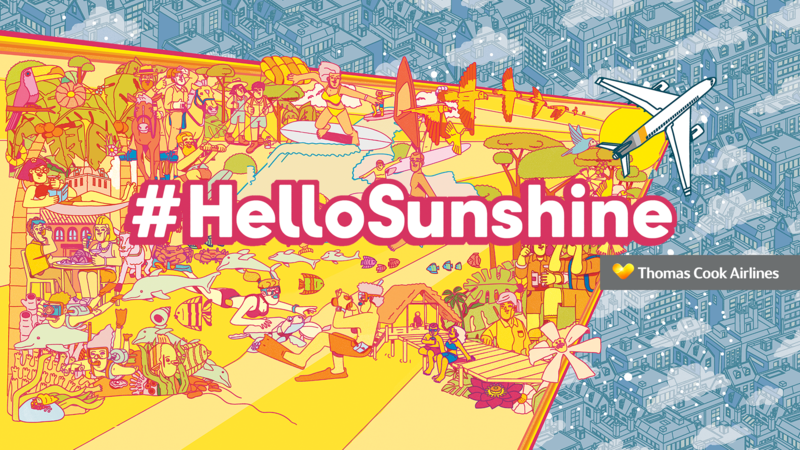 The #HelloSunshine campaign drove intrigue and interest with a competition promoting an event that brought the Caribbean culture, fun and sun to a dreary day in Manchester (purposefully coinciding with a Manchester United home game that increased footfall in the area). We designed a Facebook Live event page and to drive footfall to the spectacle we designed a competition to win complimentary flights to Tobago. To enter, participants simply used the Facebook RSVP button to register their interest. To double the chance of winning, Catch actively encouraged people to share selfies while at the event, increasing impressions of the campaign as a result. The event itself had shoppers stopping in their tracks as we transformed an ordinary space into a winter-sun extravaganza with a specially commissioned Rob Pybuss animation, which was integrated into a video on Tobago tourism and, using light projection, cast onto an enormous backdrop to the event. We also organised an array of Tobago style activities including Caribbean dancers, steel drummers and Thomas Cook Airline flight attendants handing out promotional material and sunglasses. To ensure we extended the awareness of Tobago as a winter sun destination and the fun of flying with Thomas Cook Airlines, the event was relayed in real-time over Facebook Live. The social campaign maintained its momentum, with another competition to win flights, which encouraged people to watch and comment on the campaign video that Catch swiftly produced after the live activation. We also supplemented the organic word of mouth and social sharing with Facebook advertising, targeting specific audiences including those who watched the video but did not necessarily comment. The event itself had approximately 8,000 people pass by, with the live stream viewed by a further 66,000 + viewers online. Across Facebook more than 47,000 users were actively engaged, from a reach of 100,000 and in total 400,000 watched the campaign videos - 60% over our target. At each touchpoint, Catch ensured it was educating the audience about the wonders of Tobago and flying with Thomas Cook Airlines with social posts that linked to blog posts and sales pages on the website. Our content was also tailored to ensure we diversified the audiences engaged with the campaign, making sure we didn’t retarget people we had already served ads to and experimenting with building segmented audiences. We also targeted male and females differently, with male targeting being more aviation focused and female targeting leaning more to cultural interests. And to further support the activity an email campaign had a 15% open rate from over 350,000 emails sent. From the competition Catch encouraged over 4,200 entrants which was 6% over its target. In summation, a big idea was executed with simple engagement across multiple channels. It excited audiences online and off with a huge amount of positive sentiment being posted and shared. 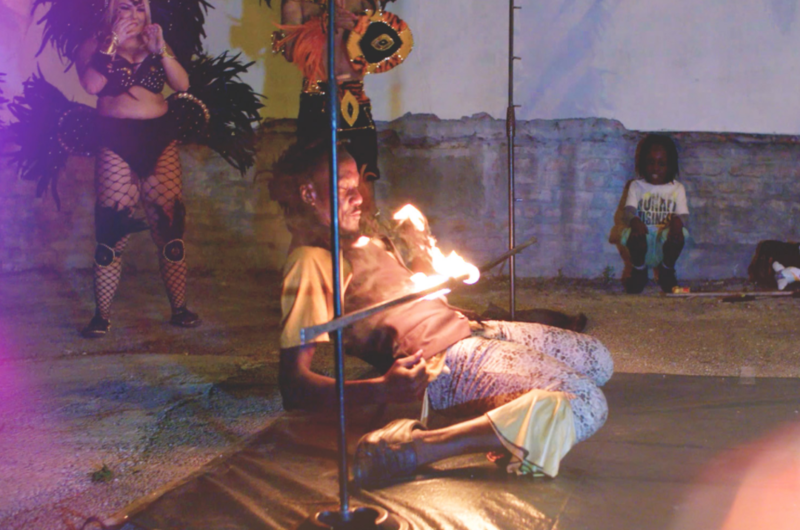 Ultimately, Catch achieved in its objective to educate the people of Manchester about a new route from their airport to Tobago, courtesy of Thomas Cook Airlines.